One of my favorite places to find peace of mind and inspiration in the East Bay is the Albany Bulb. Last Wednesday my most treasured spot there had some great new graffiti art to marvel at, and though a dog walker mentioned the snakes in the grass, I couldn’t wait to explore. 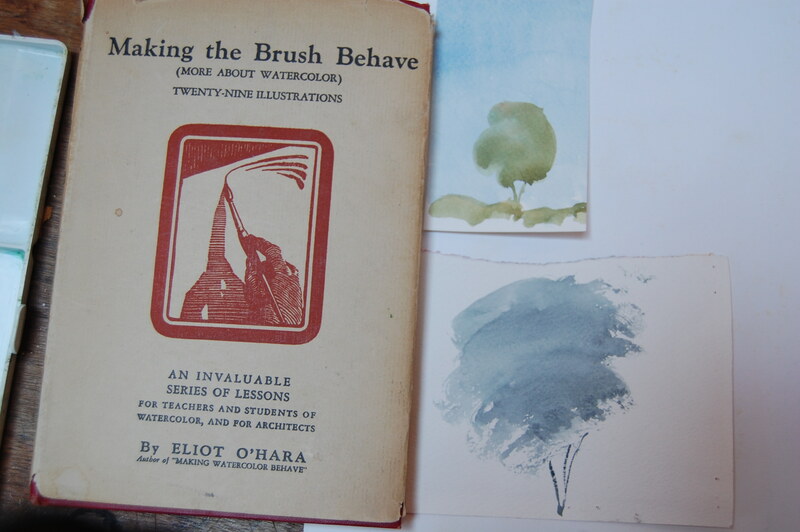 I’ve been reading a little book called ‘Making the Brush Behave’ (irresistible title) by Eliot O’Hara from 1936, and wanted to try out some of his exercises. As I looked around I could see so much to paint I didn’t know where to begin. The view towards Mount Tamalpais is always fascinating because as the light changes and the sun comes in and out, the distant range of hills seems to almost be alive with color. If the weather is calm, sounds of walkers and dogs echo around and the jolting freeway seems a million miles away. Pretty much a blissful time is always waiting here. 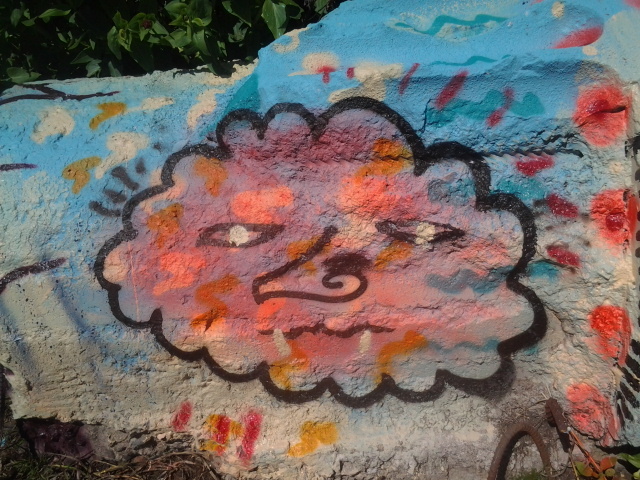 On Wednesday however, the graffiti was beginning to whisper louder still and I couldn’t resist looking more closely. This litter bin was a great place to start, being so simple and striking. 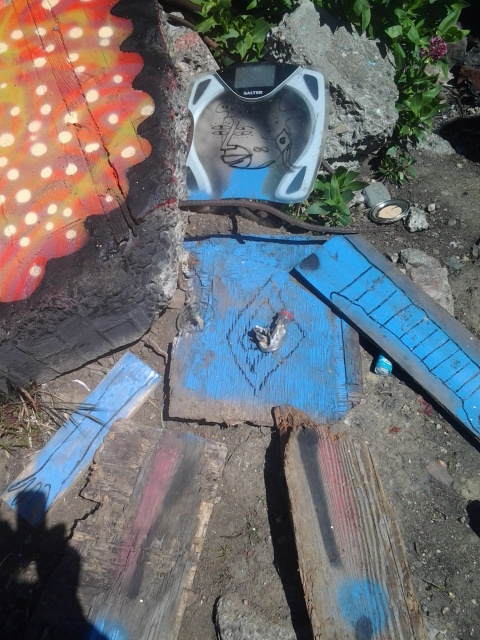 It was even signed by the artist, Feral, or was it Feraz? 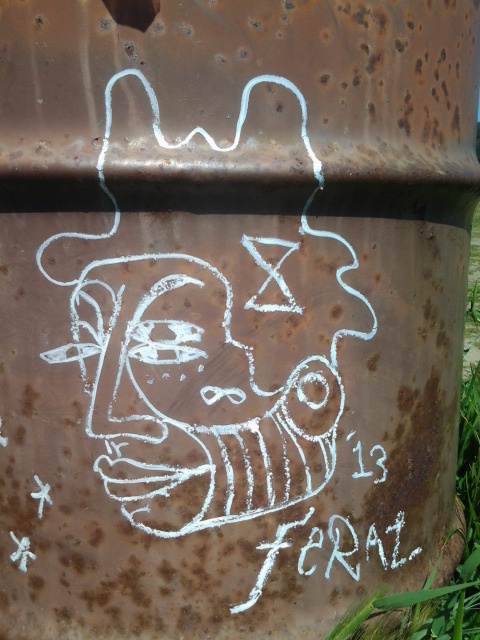 Anyway I liked his graphic style on this old, rusty oil drum with just a piece of chalk or soft oil crayon? A little further on, this snake began hissing and I swear I heard that hyena on the left begin to laugh and snigger. This guy just wanted to talk and talk and I had to sneak away when he wasn’t looking. You know the kind. The art was new, it was loud and it was exciting. The wind was absent and the sky streaked with high cloud. The water of the bay lay calm and flat and I was finally ready to follow Mr O’Hara’s instructions (!!?? *#) with a big fat brush. One of the magical things about using watercolor is how it changes as it dries. When you add a blob of paint with a quick, satisfying sweep and sit and watch it dry, everything about the hue and intensity of the color and the way the paper shines through the transparent pigment is a little miracle of chemistry. If your paper is rough then this can become an essential element in the process too. What Mr O’Hara points out over and over again, is that confident strokes are essential and so I’ve started to really simplify shapes even more than I did before. This line of trees for instance, is painted in a few strokes of connected color, twisting the brush quite quickly to get the raggedy edge of foliage. 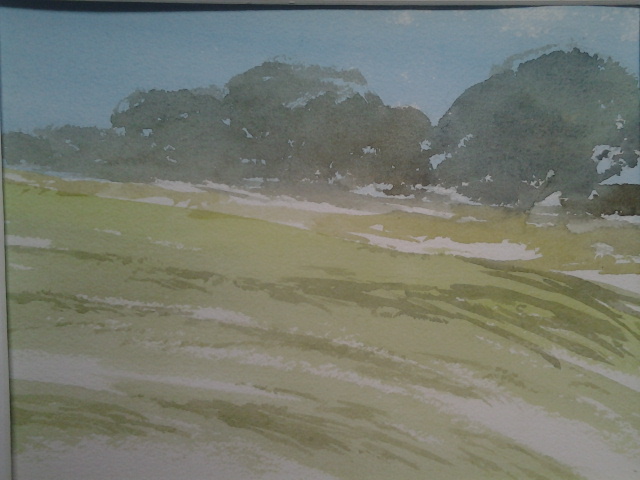 I’ve learnt to start at the place I want to be the darkest (in this case the right side) and as the brush loses more color and the stroke becomes fainter, it can create a sense of distance. I took the sketch below straight to the studio when I got home and washed out the middle distance a little, repainting when it had dried. I wish I could do the same with the sky but I don’t think it would work because the pigments are staining. 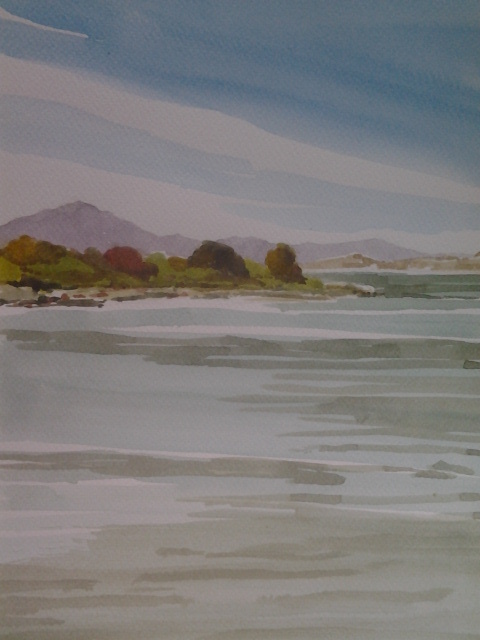 There’s always so much to learn as you inch forward with watercolor and at the Albany Bulb there can be an audacious freedom around that speaks volumes if you can tune in. This entry was posted in Art Classes, Art Journal and tagged Albany Bulb, Art journal, California, East Bay, east bay landscape, Fran Osborne, watercolor. Bookmark the permalink. Nice post and a lovely watercolor. I think the contrast between O’Hara’s academic ‘process’ and the wild spontaneity of the graffiti artists is worth mulling on. Thanks again codaprojects. I suppose there are many ways to paint in watercolor and his approach is just one but sometimes it’s good to go back to the basics – like practice for a musician or dancer. I really enjoyed just doing small watercolor sketches of single trees without thinking about whether I could make a bigger painting out of them. Sometimes, I prefer the sketchy sketches too but I am definitely learning something from O’Hara so I will post more updates as I work through his book, which is still available btw. for under $5. 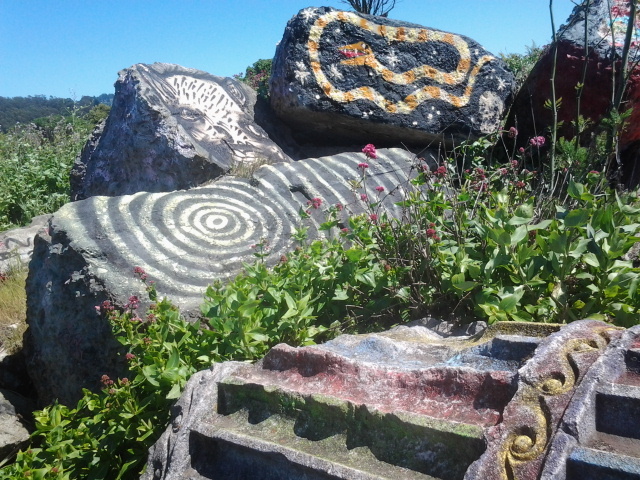 As for how this fits with the wild spontaneity at the Albany Bulb, I will continue to ponder, except that I know the art there opens up a different conversation in one’s head than happens at say a park in Oakland, or Point Pinole for instance. Because the land is made up of landfill and is full of re-bar and relics of buildings, it’s already a different kind of place from the usual plein air location. Does the landscape call in the art it feels at ease with? All completely mysterious to me but endlessly fascinating and compelling nonetheless. I’d be interested to know more of your thoughts.